The name Orthoptera, derived from the Greek "ortho" meaning straight and "ptera" meaning wing, refers to the parallel-sided structure of the front wings (tegmina). Orthoptera probably arose during the middle of the Carboniferous period. Most living members of this order are terrestrial herbivores with modified hind legs that are adapted for jumping. Slender, thickened front wings fold back over the abdomen to protect membranous, fan-shaped hind wings. Many species have the ability to make and detect sounds. Orthoptera is one of the largest and most important groups of plant-feeding insects. 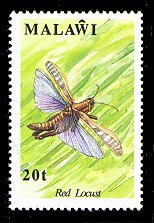 Orthoptera is generally regarded as a dominant group in most terrestrial habitats. These insects feed on all types of plants and often cause serious economic damage. Swarms of grasshoppers (locusts) regularly appear in parts of Africa, Asia, and North America and destroy crops over wide land areas. Mole crickets are major pests in lawns and golf courses in the southern United States. Several species of field crickets are reared commercially as fish bait. Acrididae (short-horned grasshoppers and locusts) -- Herbivores. Common in grasslands and prairies. This family includes many pest species such as the twostriped grasshopper (Melanoplus bivittatus), the differential grasshopper (M. differentialis), the African migratory locust (Locusta migratoria), and the desert locust (Schistocerca gregaria). Tetrigidae (pigmy grasshoppers) -- Herbivores. Similar to short-horned grasshoppers but with a pronotum that extends to the back of the abdomen. Tettigoniidae (long-horned grasshoppers and katydids) -- Herbivores. Females have a long, blade-like ovipositor. Some species are pests of trees and shrubs. Gryllidae (true crickets) -- Herbivores and scavengers. Females have a cylindrical or needle-shaped ovipositor. This family includes the house cricket, Acheta domesticus. Rhaphidophoridae (camel crickets) -- Scavengers. Most species have a distinctly hump-backed appearance; a few are cave dwellers. Gryllotalpidae (mole crickets) -- The front legs are adapted for digging. Most species feed on the roots of plants, but some are predatory. In many species of Orthoptera, the males use sound signals (chirping or whirring) in order to attract a mate. The sound is produced by stridulation -- rubbing the upper surface of one wing against the lower surface of another wing, or the inner surface of the hind leg against the outer surface of the front wing. Each stridulating species produces a unique mating call. In fact, some species may be so similar to each other that they can only be distinguished by their mating calls. Species that produce sound also have auditory (tympanal) organs. In crickets and katydids, these "ears" are on the tibia of the front legs. In grasshoppers, they are on the sides of the first abdominal segment. The snowy tree cricket, Oecanthus fultoni (family Gryllidae), is often called the temperature cricket. Adding 40 to the number of chirps it makes in 15 seconds will equal the ambient temperature in degrees Fahrenheit.